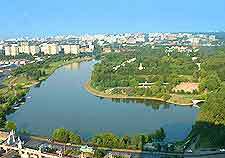 The Moscow River meanders its way through the Central Federal District of the city and passes many historic landmarks along the way. 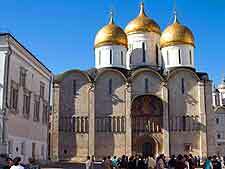 Built between 1475 and 1479, the Cathedral of the Dormition is located on Cathedral Square, within the Kremlin. Although this building is typically Russian in character, it was actually designed by a leading Italian architect from Bologna. 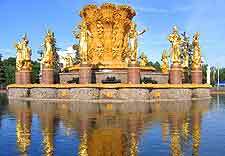 The Golden Fountain serves as a major attraction within the Exhibition Centre and comprises no less than 15 golden statues, each of which represents one of the 15 former Soviet republics. 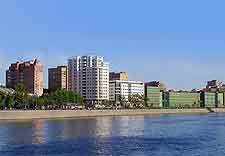 Many visitors to the city will find that a river cruise is a pleasant and enjoyable way to sightsee in the city, with a variety of different packages being available. English-speaking guides are usually onboard to answer any questions. 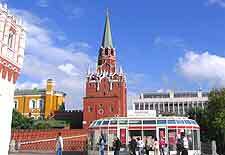 For tourists, a visit to the Kremlin is simply a must and this epic complex began its life in 1485, when construction of its triangular wall structure commenced. 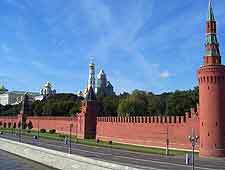 A series of 20 towers are present on the Kremlin walls, with the tallest measuring just over 70 metres / 230 feet in height. The opulent and highly extravagant Grand Kremlin Palace is part of the city's Kremlin and is just over 160 years old. 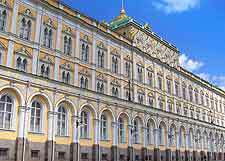 Once the official residence of the Tsar, the Grand Kremlin Palace is home to around 700 different rooms. The heavily fortified Russian Kremlin is a simply enormous and unique riverside complex. Here, a section of its distinctive red fortress wall is pictured alongside a main road. The Hotel Ukraina is perhaps the city's most famous accommodation option and is actually currently Europe's tallest hotel. One of the 'Seven Sisters' of Moscow, this skyscraper is just under 200 metres / 656 feet in height and has an overall capacity of around 1,600 beds. 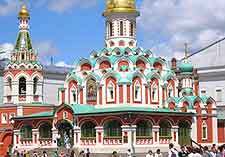 An especially ornate Russian Orthodox church, the Kazan Cathedral stands on the north-easterly side of Red Square and has origins in the early part of the 17th century. The Kazan Cathedral was completely rebuilt during the latter part of the 20th century, after being destroyed by Joseph Stalin in 1936. 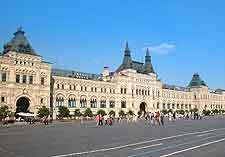 The Main Universal Store (GUM - Gosudarstvenny Univermag) is simply enormous and dominates a large chunk of Red Square. This really is the perfect place to start any Russian shopping trip. 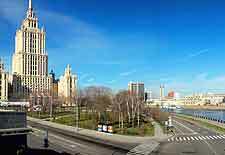 Riverfront buildings come in all shapes and sizes in Moscow, with a number of modern high-rise structures making an appearance on the city's skyline in recent years.